Bosch 2607017063 Screwdriver Bit Set, 32 Pieces £7.99 with Free Delivery for Prime Members @ Amazon (Non-Prime free delivery over £20 or £3.99 under £20 so cheaper to order for free store collect from Screwfix for £9.99). This handy 32-piece screwdriver bit set is essential for all screwdriving and fastening work. 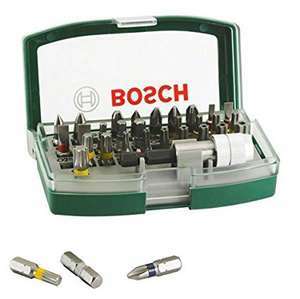 This Bosch set offers the right screwdriver bit for every application and every conventional screw including: Phillips (Ph), Pozidriv (Pz), Slotted (S), Internal Hexagon (IS), Torx (T) and Security Torx (Th) screw heads. This set is ideal for every DIYer with a clear, colour-coded bit layout that allows the user to quickly identify each screwdriver bit. The magnetic, quality quick-change adaptor with auto-lock enables the user to change between screwdriver bits effortlessly. It comes in a robust case with a belt clip on the reverse, making it a must-have set in any tool kit. Bosch is a leading manufacturer of accessories for power tools and is an innovation leader with 125 years of experience. Bosch’s aim is to develop appropriate accessories for all applications, for more efficient working and for new materials. Bosch offers the ideal accessories for virtually all applications, users and brands of power tools.